After selling one of the most controversial players in the history of English football for £75m, you could forgive the powers-that-be at Liverpool for playing it safe for a while. Instead, the Reds are seeking to replace Luis Suarez with Mario Balotelli - a man once dubbed "unmanageable" by Jose Mourinho who tried to do just that when they were at Inter Milan together. Balotelli, 24, enjoyed cult status during his three-year spell at Manchester City and appears to be on his way back to England in a £16m move after only one full season at AC Milan, the club he supported as a boy. But other than a mutual love of scoring goals, and a regular habit of making the front as well as the back pages, what else do the strikers share? And what makes them stand apart from each other? Just shy of £150m has been cumulatively spent on their talents already, so despite a list of misdemeanours as long as the Anfield touchline, it does not take a genius to see that football's in-the-know managers see something different in this colourful pair. Balotelli's single Champions League success at Inter was blighted as Mourinho cast him aside for a lack of effort in training, but the mercurial Italian left the San Siro in 2010 with three league medals stashed in his expensive luggage. He dangled a leg at a loose ball on the final day of the 2011-12 campaign for his only assist in 54 league games at Manchester City, though it proved decisive as Sergio Aguero lashed City to the title - Balotelli's fourth league win by the time he turned 21. Despite boasting a glittering trophy haul to match the bling of his jewellery, on an individual level, Balotelli is unable to match Suarez, who at 27, is three years his senior. The Uruguayan shared the European Golden Shoe award - claimed by the continent's top scorer - with Cristiano Ronaldo in 2013-14 and was voted player of the year by both his fellow professionals and the Football Writers' Association. A season which included three hat-tricks and 31 league goals - despite missing six games at the start of the season through suspension - eventually tempted Barcelona into shelling out £75m for his services - despite that well-publicised biting incident at the World Cup. After arriving alongside Andy Carroll to fill the void left by Chelsea-bound Fernando Torres at Liverpool in January 2011, Suarez took 16 minutes to notch a debut goal from the bench. It was a sign of things to come. A further 68 followed in the league, complemented by 23 assists, but for all of his headline-grabbing contribution and average of a staggering 0.63 goals per game, Suarez's impact on Liverpool's win ratio is negative. The Reds won 61% of their 18 matches without him in the side, but only 48% when he was included. Purely on a statistical level, Balotelli also hindered Manchester City during his time in the Premier League. His presence saw City win in 59% of their matches compared to 70% when he played no part. The man who made his debut in Italy's third tier at just 15 has also been sent off for club or country in each of the last five seasons. "Obviously he has that baggage," former Liverpool midfielder Jimmy Case told BBC Sport. "But I always want a side to have one player who their opponents will know is capable of anything, no matter how well prepared they are." At 15, Suarez head-butted a referee while playing for his first club - Nacional - in Uruguay. It was a first of many blemishes on his CV. A bite for Ajax, the racial abuse of a player and a bite at Liverpool, and a match-saving hand-ball and bite for Uruguay are just some of what has followed. Throw in an obscene gesture made to Fulham supporters and a taunting dive when celebrating in front of Everton manager David Moyes in 2012 and his charge sheet is prolific. Balotelli, though no angel, prefers to keep his crime petty by comparison. He indeed described himself as shy to Oasis star Noel Gallagher in a BBC interview in 2012. Shy may be downplaying it several levels, but an image of him pointing a shotgun down a camera with the message: "a big kiss to all the haters", is as uncomfortable as it has got for the Palermo-born player. "I describe him as a box of fireworks," added Case. "You put your hand in the box and will you get a banger or something beautiful? Setting off fireworks in his bathroom and throwing a dart at a youth-team player featured during Balotelli's time in Manchester, as did his decision to back-heel an effort wide when through on goal in a pre-season friendly against LA Galaxy. City manager Roberto Mancini failed to see the funny side and substituted his striker but, by and large, Balotelli was viewed more as a pantomime villain. Suarez, on the other hand, has earned widespread condemnation after his many incidents. Sorry is far from the hardest word for these players, who have been the subject of many a rushed-out press release by clubs clambering for shelter from criticism. After biting PSV Eindhoven's Ottman Bakkal in 2010, Suarez said he could only feel his heart beating in the heat of the moment. "You are not able to think about what you are going," he added. And clarity of thought was again evasive when he said he was "deeply sorry" for a similar bite attack on Chelsea's Branislav Ivanovic in 2013, before extending his apology to "the entire football family" when Italy's Giorgio Chiellini was next in line for a bite at the 2014 World Cup. Balotelli, meanwhile, has tugged at the heartstrings in the past, declaring his "love" for manager Mancini when apologising for his crucial sending-off in a defeat by Arsenal in 2012. "You've got to hope the player matures," ex-Liverpool full-back Stephen Warnock told BBC Sport. "Balotelli's at a stage now where he must be thinking 'I'm only going to get so many more chances.' He will know this is a massive opportunity to resurrect himself in England." Heard the one about Balotelli being dressed as Father Christmas and handing out money to the homeless in Manchester city centre? What about when he confronted a school bully on behalf of a child in need? Or when he drove to a women's prison in Italy for a look around? And did he really explain why he had £5,000 in cash with him to police by simply saying "because I'm rich?" It depends on who you ask, and whether you believe what you read. But what is certain is that crazy rumours follow Balotelli around far more closely than any central defender. Suarez, while explosive on the pitch, is more sedate off it. Not once did he call into a school to use the toilets as his potential Liverpool replacement did in 2012. "He was just walking round campus like he owned the place and everyone was following him around," said Xaverian College student Edaward Gasson. Tongues will be wagging on Merseyside. Mario is on the loose. The prospect of match-winning genius being served up lends itself to forgiveness by many football fans and Liverpool's supporters backed Suarez during what the striker called "difficult" moments. Suarez thanked Kopites for their backing in an open letter upon joining Barcelona, but this Jekyll and Hyde character was a like not seen in the English game since Eric Cantona in the 1990s. Liverpool fans privately frowned upon the distraction Suarez's behaviour drew, but revelled in his brilliance and desire to win. Tears in the stands at Selhurst Park when Liverpool let a three-goal lead slip to Crystal Palace during their title run in were indeed only shared by one man on the turf - Suarez. A player's appetite for success and willingness to graft resonate deeply with fans of any club and Balotelli is arguably yet to demonstrate similar will. "When Balotelli came back to Italy there was complete fever for him, he was loved," says Italian football journalist Tancredi Palmeri. "But last year, he became a bit of a scapegoat and the fans did not get what they expected from him. As Milan struggled, he was seen as their star and so the finger was pointed. "In the Champions League round-of-16 against Atletico Madrid he produced a performance which was viewed as one of the worst ever and it was the final straw. Fans thought his attitude was lacking and with this and the fact Milan needed money, a move was seen as the best option." The adoration by their own fans and penchant for sticky situations is not all Balotelli and Suarez share as both faced challenges early on in their lives. Balotelli, the son of Ghanaian immigrants, was placed into foster care and adopted by an Italian family by the age of three, while Suarez, one of seven brothers, grew up in poverty in his native Uruguay. Honing his skills in Montevideo, Suarez earned money as a street sweeper at the age of nine and left for Dutch side Groningen by 19 to follow his childhood sweetheart Sofia Balbi and her family to Europe. Survival runs through the stories of both players in their formative years, with Balotelli eventually distancing himself from his birth parents. "Suarez is done and gone," added Case, who made 269 appearances for the Reds. "When I was there, Kevin Keegan left and I had no idea how we would get by but Kenny Dalglish came in. At Liverpool, we've seen Ian Rush, Robbie Fowler, Michael Owen, Fernando Torres - there is always someone to pick up the mantle. "Balotelli, at 24, is a superb talent and could be there and a hero up to his 30s." Longevity and consistency in the career of one so volatile seems a distant hope, but Liverpool will hope a maturing Balotelli, who hit 26 goals in 43 league appearances at AC Milan can be controlled off the pitch and unleashed on it. "You can't argue with the fact he is a world-class player and Rodgers has unlocked potential before - Daniel Sturridge had moved around a lot before signing for the club," added 32-year-old Warnock, who is now at Leeds United. "If he gets the best out of him, Balotelli is wonderful business, but the first thing Brendan Rodgers will say is that Balotelli is not a direct replacement for Suarez and the boy is his own man." Former Liverpool striker Neil Mellor told BBC Sport: "Balotelli is a player who can produce something from nothing, not quite to the level of Suarez but capable of those key moments to win games at the highest level. "At City, the baggage outweighed what he did on the pitch and his arrival is therefore not one of excitement but more of uncertainty." Questions to be answered then. Why always you Mario? 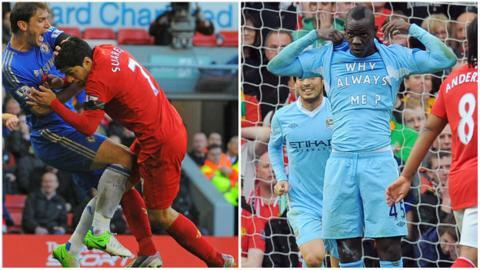 Why always you?